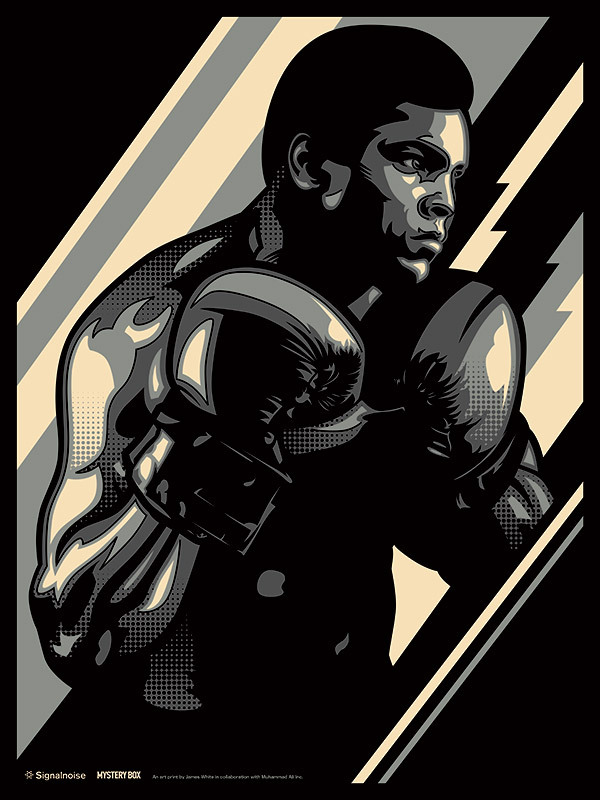 Muhammad Ali, gold “Championship” edition. Initial digital sketch and a WIP shot. The brass over at Mystery Box (who happens to be a huge Ali fan) struck up a conversation with the licensing people at the Ali camp and we’ve been in talks for quite some time. I designed this poster right at the beginning to grease the wheels, but proceedings have been sluggish. So we decided to release the design to see if Ali fans might spark interest. We have big plans for this one, gold ink and all that. The “Championship” Edition. But to get the numbers right takes a lot of planning. 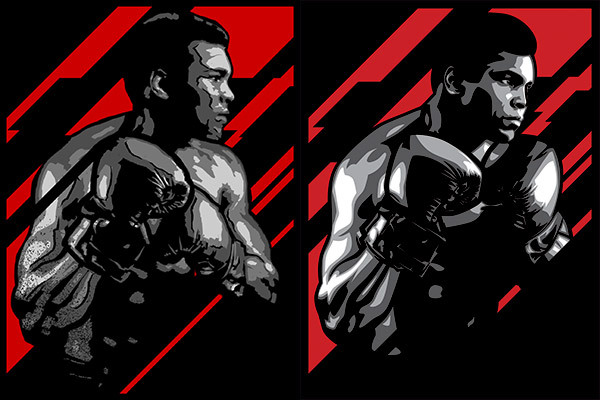 Seen above are the 2 colour versions I put together, as well as my initial digital sketch and in-progress vector shot. Spent a lot of time getting those shapes just right, and added some smooth halftones for dimension. Needed it just right to honour the champ. Anyway, we’re hoping to make this one a reality at some point. Man this is slick. I like how you incorporated halftone patterns in there. Also, I still think that your digital sketches might be stronger in terms of the intensity they have compared to the slick, clean vector shapes. *I’d love to see you create a poster based on the digital sketch, without the vector refinements. Thanks man. I see your preference and here’s where I stand. I start almost every poster in the sketchbook developing what the concept might be in thumbnail form. I then move into Photoshop and scribble up the digital composition to study colour, form and type. After I nail it down I need to make a decision… do I move to vector or continue with the digital paints? That decision is key and involves 2 considerations: style compliment and final print output. The 2 styles are quite different and I need to make sure the final compliments what or who I’m designing. As for printing, if the final will be screen-printed I need it to be vector. I just work easier in that format with trapping, colour selection or whatever. If the final will definitely be digitally printed, then I can go hog-wild in Photoshop with the paints. I’ve done several pieces that were 100% Photoshop paints. 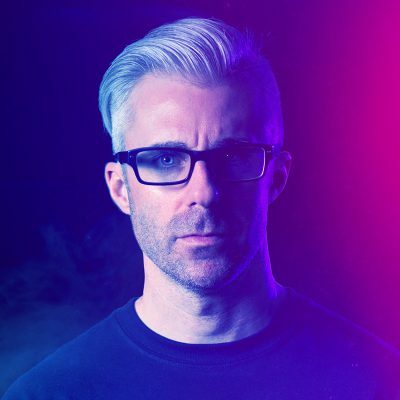 All my Far Cry 3: Blood Dragon stuff, my DRIVE poster and the FIRST BLOOD poster were all created in Photoshop. Great poster. I’d like to see the red version finalized though and perhaps your usual “grudge” vectors instead of the halftone pattern. I stumbled upon this looking for other Ali related imagery, and i think this is the best i have seen in a very long time just searching the web regarding Ali. Only to see that considered working with us and somehow the deal went south. Contact me so we can talk, not sure who you had talked too but i beleive your art has MAE licensing potential.